I have a chronically-ill elderly aunt and am wondering if there is a mitzvah involved with visiting the same person often. Is there a point in time during which that mitzvah has been fulfilled? The Talmud says, further, that visiting the sick one “removes one-sixtieth of the illness.” This needs explanation, but it certainly is saying that one can help the situation of the sick by visiting. In Jewish law, there is no difference between one who is a short-term patient or chronically ill; the mitzvah to visit applies equally to both. The mitzvah of visiting the sick also has no limit; as many times as one visits, he or she performs a mitzvah each time. Given the newfound longevity of our generation, this blessing goes hand-in-hand with a greater number of elderly who are chronically ill, presenting both a challenge and an opportunity. The challenge is, as you reflect in your question, the difficulty in visiting a sick relative over a protracted period. This can be taxing and cumbersome, especially if the patient is not always in the most jovial or congenial of moods. Yet this also provides an opportunity for the performance of chesed and developing our likeness to God. We were created in the image of God, and visiting the sick, especially when it is difficult to do so, empowers us to develop that image. It is an opportunity to help someone who truly needs help, and at the same time creates a different self, one that is a true giver and less self-centered. When visiting the sick, especially someone you’re considering visiting often, it’s important to visit when that individual needs it and not when it’s convenient for you. Your aunt should not be viewed as an object through which you fulfill your mitzvah, but rather as a person who has needs and feelings. The purpose of your visit is not to “do your mitzvah,” but to fulfill the emotional and physical needs of your aunt. As such, we need to be sure that visits are not a burden upon the ill, but rather are dedicated to uplifting them. Many times the ill person might feel as though he or she needs to entertain the visitor even if at times he or she doesn’t have the strength or desire to do so. And when we visit, we should not forget that an important part of the mitzvah is to say a prayer for the ill person’s welfare and recovery. May this mitzvah bring the Almighty to fulfill the verse: “Heal us and we will be healed” (Jeremiah 17:14). Every so often, I like to remind folks about the things that the Jewish Federation of Fort Worth and Tarrant County does for the community. The Federation supports a ton of educational programs in the area. But until the evening of Jan. 27, I had little idea how the funds donated to the Federation in Fort Worth would impact Jews in other countries. 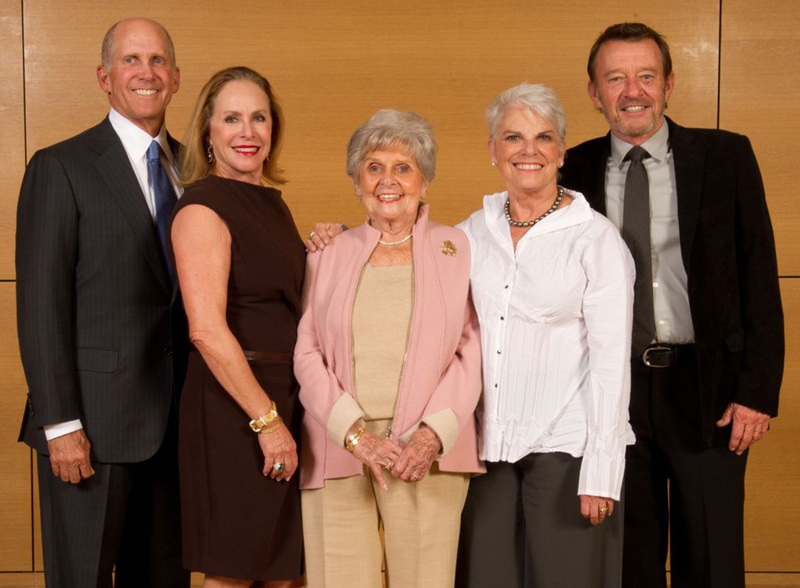 The event was “The Legacy of Giving Award” hosted by the Jewish Federation of Fort Worth and Tarrant County and presented to the Rosenthal family, who, as most folks know, have a terrific history of donating resources to all sorts of organizations and events in Tarrant County. As those who read the Texas Jewish Post might also know, the guest speaker was Alina Spaulding, dean of admissions at American Hebrew Academy in Greensboro, N.C. (she was also guest speaker at the Jewish Federation of Greater Dallas’ Men’s Event the following evening). I can’t do her words justice here; suffice it to say that her talk about moving from despair in Russia to hope in the United States moved me as I suspect it moved others (given the response from the crowd at the event). It was a more than appropriate talk for the Fort Worth Federation’s campaign kickoff event, and I encourage everyone in the community to be responsive when your receive that donation envelope or phone call on Super Sunday. It’s important to support the Federation, not only to uphold the programs of Tarrant County (though they’re hugely important), but also to help the Alinas of the world, and their families. … to the Rosenthal family on receiving the Legacy of Giving Award. And thank you for being part of the community. Ina Singer tells us that her grandson Bobby Greenberg, his wife Julie and their son Cooper (who is 4½ months old), visited her in Fort Worth from their home in Clearwater, Fla., between Jan. 19 and 26. This must have been a fun visit for all! Jewish Women International will have its monthly meeting at 9:30 a.m. on Wednesday, Feb. 6, at Beth-El Congregation, 4900 Briarhaven Road in Fort Worth. Guest speaker will be Rabbi Andrew Bloom of Congregation Ahavath Sholom, who will talk about what inspired him to be a rabbi. It should be an interesting presentation (Rabbi Bloom is always worthwhile to listen to), and all are welcome to attend. According to Barbara Rubin, the Jan. 23 Daytimers event, featuring Janice Rubin, experienced an overflow crowd. Probably no wonder — Janice Rubin was on hand to share insights about Yiddish folk music, and much of what was performed came from her album, “Feels Like Family.” Janice was accompanied by Barry Roberts, one of the featured performers on the album. In addition to singing, Janice explored lullabies, children’s play songs, humorous and satiric songs, and ballads of Jewish revolutionaries of czarist Russia. Barbara introduced Janice (who is her daughter — and Barbara writes that the introduction offered her the opportunity to define the Yiddish word “kvell”). Emcee for the day was Edythe Cohen and Louis Schultz and Rosanne Margolis greeted the guests at the door. Mary Frances Antweil and Adele Arensberg hosted the buffet table, while Larry Steckler and Ellen Appel photographed the event. Moving on, the February Daytimers program will feature Dr. Jane Guzman Pawgan, who will present “The Story of Ma and Pa Ferguson,” a strange chapter in Texas history. Beginning Tuesday, Feb. 5, she’ll be presenting the first of a five-part series titled “Jews in America,” which will focus on the experience of Jews in the United States from colonial times through the late 1940s. The presentations start at 7 p.m. and will run through Tuesday, March 5. This lecture series is part of Congregation Ahavath Sholom’s b’nai mitzvah course, but you don’t need to be part of the class to attend and enjoy the event, which is free and open to the public. The presentations take place at CAS, 4050 S. Hulen in Fort Worth. … is news! If you have family news, promotional news, holiday news (Purim is coming up and Tu B’Shevat has just passed) or generally want to brag about something, send it along. I’m at awsorter@­yahoo.com. The words my children would roll their eyes at were: Did you know that … ? They always dreaded the bits of Jewish knowledge I would throw at them although I’m not sure why — there certainly wasn’t going to be a test, and more often than not, the tidbit was sparked by something that was happening at the moment (I do try for relevancy, plus lessons tend to stick better if they relate to the moment). So how can you become a parent who has the relevant Jewish story filled with the right values ready for the “teachable moment”? Listen, learn and tuck away the important messages for the right moment. There are questions that children ask that we answer easily. There are questions they ask that are simply beyond answers. And then there are those questions that challenge us because we must question our own thoughts and values. An ethical dilemma is hard, not because we don’t know what is right and wrong, but because in a dilemma there are competing “rights” — how do we choose? No one wants to be told what to do — especially our children — so Judaism has the perfect method. Every answer begins with the statement “The rabbis said….” In other words, you, don’t need to listen to me because people addressing these issues were much wiser. So with all this introduction in a short little letter, what’s the dilemma and what are the words of wisdom for the day? What do we do and what do we say to our children (and ourselves) when we see people begging on the street? This is not a new problem and we can turn to the wisdom of a Chasidic rebbe, Chaim of Sanz (who died in 1786), for the answer. “The merit of charity is so great that I am happy to give to 100 beggars even if only one might actually be needy. Some people, however, act as if they are exempt from giving charity to 100 beggars in the event that one might be a fraud,” he said. Giving the benefit of the doubt is an important Jewish value. Think about it, talk about it, do it — and, of course, teach it to your children. Jews have always discussed and disagreed — debating seems to be in our DNA. Our great texts were born of sages pitting intellect and ideas against each other. Much of what we are today came from prior collisions of intelligent minds. But I wish we’d argue more today. Chances to challenge each other run every week in our TJP. But where are the Letters to the Editor? A rare one recently appeared at the bottom of a back page, and I was especially thrilled to see it because I take exception to its premise. The writer railed against the practice of Torah dedications, equating them with buying the privilege of naming something, anything, in a synagogue. I think very differently. Brick-and-mortar congregations long ago learned that “selling” the premises — putting a price on something, and putting the buyer’s name on a plaque in or near that something — is good for finances. But a Torah is not a social hall or a classroom or a water fountain. It’s our life, and it’s never for sale. A personal story: my beloved Boubby the Philosopher and her husband, my Zeyde, were charter members of a little shul, one of many “affinities” founded by early 1900s immigrants who came to the same places in America from the same parts of Europe. They were so devoted to their congregation, that when neighborhood demographics changed and the shul moved to a new location, they moved their own family near it. The original social hall, classrooms, water fountain were left behind; that’s what happens to brick-and-mortar institutions as populations shift. But the Torahs went with them. One had been given to the shul by my mother and her siblings in recognition of their parents’ abiding loyalty to that congregation, wrapped in a mantle saying those two founders were being honored by their children with this gift. Almost a century later, all the little shul’s original members had long since died and the Jews of their city were once again moving away. Only a few old folks were still clinging to the neighborhood, so the congregation’s directors — my Boubby and Zeyde’s youngest son was one of them — reluctantly decided to close their doors. The building was sold to strangers, but the Torahs were given to family members of the founders for rededication in their own congregations. No money was involved when the Roth Torah, named for my beloved grandparents, came to live in the ark of my own congregation here in Dallas. I suspect that our TJP letter-writer was referring to the recent dedication of a new Torah by another local synagogue because some money was requested here, but it was not to purchase the Torah itself. Rather, it was to offer something truly priceless to any Jew who wanted it. A family or a synagogue may decide to recognize one or more of its own or to mark a very special occasion with the precious gift of a newly-written Torah to the congregation. And the writing of a new Torah also offers the opportunity to fulfill the last of our 613 Commandments, which enjoins all Jews to write a Torah within our own lifetimes. Of course we’re not all scribes, but we can touch the tip of a scribe’s quill pen as he writes, which symbolically allows us to fulfill that commandment. Although we are asked to give something to the congregation for this essential privilege, nobody is “selling” that Torah, or “buying” a part of it: Rather, this is a kind of quid pro quo through which every Jew may benefit. My own synagogue’s first Torah is named for the prominent local businessman who donated it when the congregation was just forming and had none. Among its others are one given by a man in memory of his wife, one given by parents in memory of a child, one given by a couple to honor their own young children. Only one was newly scribed, presenting us with the great opportunity to partake in that final commandment. And the mantles of all our Torahs bear the names of those who will be remembered and honored forever, long after the social hall and classrooms are vacant and the water fountain has run dry, because the holy scrolls will be transplanted to new Jewish venues, as so many rescued Holocaust Torahs have been. So Judaism goes on, and so should exchanges and explorations of opinions and discussions. Hooray for Letters to the Editor! Let’s have lots more of them! A common theme emerges when Nicole Small talks about the new Perot Museum of Nature and Science, of which she is executive director. The opening of the four-story Perot Museum at the northwest corner of Field Street and Woodall Rodgers Expressway was a definite milestone for Small, 39, the daughter of Dr. Charles Ginsburg, senior associate dean at UT-Southwestern Medical Center and a pediatrician. That marked an 11½-year journey that saw three museums combine into one in a new building that had The New York Times’ museum critic’s jaw drop and The Dallas Morning News list Small as one of its Texan of the Year finalists. Small was named president of the Dallas Museum of Natural History in 2001, two years after receiving a Master of Business Administration from Northwestern University in Evanston, Ill., and after spending one year in San Francisco. She and her new husband, Justin, moved back to Dallas, and the museum job felt like the thing to do. “I grew up in a house where my father was a pediatrician and my (late) mom was a full-time volunteer,” she said, adding that her family attended Temple Emanu-El, where her two daughters, ages 4 and 7, went through preschool. “I was exposed at a very young age to volunteerism, I met Nobel Prize winners when I was very young,” so she knew the importance of both science and community service. Small had previous ties to the Museum of Natural History. While serving as a consultant for McKinsey and Company in 1996-97, the 1991 Hockaday School and 1995 University of Pennsylvania graduate helped her boss, a museum board member, do a pro bono project for it. She was in for a wild ride. She helped preside over the 2006 merger of the Museum of Natural History, The Science Place and the Dallas Children’s Museum into the Museum of Science & Nature at Fair Park. That was almost a given after the new Perot Museum’s 4.7-acre site was purchased in 2005. From there, it was a matter of raising the $185 million needed, the largest chunk of which came in the form of a $50 million donation from the children of Ross and Margot Perot in their parents’ honor. Small’s pace hasn’t slowed a bit as the fundraising/construction phase morphed into operations mode. And with that, she dreams of the future Nobel Prize winner who refers to the Perot Museum as an early inspiration. She hopes children will have the fond memories of “The Perot” as children from New York have of the American Museum of Natural History and those from Chicago do of the Museum of Science and Industry. “I hope many Nobel laureates will remember The Perot as where they got started,” she said. And Small — a breast-cancer survivor who managed to oversee the opening of the museum just months after undergoing a double mastectomy — says that as a mother, as well as a museum director. “A focus on careers is important to us,” she said. “We feel it’s really important to make the connection between science and careers, so we have career kiosks set up at almost every exhibit. “There’s a whole world of excitement,” Small said, with the same look of awe a child might have when seeing giant dinosaurs or experiencing the feeling of an earthquake at the museum. I am happy to report that beloved TJP columnist Harriet Gross is back home after a rehab stay at The Legacy Preston Hollow to mend her broken femur and ankle. Though not totally back on her feet, Harriet was able to share with us some background on Beth Torah Sisterhood’s Torah Fund honorees, Marilyn Guzick and Roberta Lazarus, who will be honored next weekend at a noontime luncheon at the Crowne Plaza Hotel in Addison. Cost of the event is $32 with an additional $18 minimum donation for the Torah Fund. Checks for the lunch are to be made out to “Beth Torah Sisterhood” and the donation is a separate check made out to “Torah Fund.” To RSVP contact Elaine Scharf ASAP at 972-307-3521. Social Action: that is Marilyn Guzick’s middle name — or maybe a synonym for her vital role in the synagogue that she and husband Larry joined in 1990, when they moved to Dallas with two preschoolers. The pair loved the congregation’s interactive participation, and Marilyn quickly became active on its Holiday Committee, then moved up to serve on the synagogue board. Five years ago, she was asked if she and Larry would co-chair Karen Leynor Mitzvah Day, Beth Torah’s annual tribute to former Rabbi Jeffrey Leynor’s wife, who died in 2004 at age 38. The Guzick household was busy then with preparations for the bat mitzvah of their third child, but Marilyn credits her husband for saying “Let’s do it!” The two worked together to build this event from a one-day affair involving 150 people to a day of community service for almost 300 volunteers and over 20 activities. Social Action also now has year-round projects on a monthly (and sometimes more often) basis. The initial positive response “felt good, and it was fun,” according to Marilyn, who was soon back on the board as Social Action Committee chair, and has since taken over spearheading social action for the Sisterhood as well. Marilyn’s mother was pregnant with her when the Mimuns immigrated to San Antonio from their home in Tunisia. Most of the family is now in Austin, where Marilyn and Larry met on a blind date and married in 1984; the oil business took them to Houston and Midland before bringing them to Dallas six years later. Their children are Shana, 27, a writer/editor for Chabad in New York; Jared, 25, a wine representative in Dallas; and Alana, 17, now a junior at J.J. Pearce High School. A physical therapist by profession, Marilyn keeps her own body fit with yoga and walking the family dog. She began a Jewish journey in Beth Torah’s 1996 adult b’nai mitzvah class. She is currently in her second year of studying Biblical Hebrew and is also thoroughly enjoying her study of Mussar, the Jewish soul traits. Today she feeds her family healthy food and home-baked challah, enriching both the soul and synagogue as a regular Torah reader. For Roberta Lazarus, education is a way of life. Teacher trained in her native New York, she and her husband Robert came to Dallas in 1976, when their first child was 10 months old. They enrolled him in a Jewish preschool at age 2, and Roberta went into the classroom herself as a teacher there. Beth Torah didn’t have its own pre-school then, but the Lazaruses joined the synagogue 28 years ago, when Adam was ready for its Learning Center. And that’s when Roberta’s attention first shifted to adult education. The family moved into its Plano home in 1979, and “it was a culture shock for me,” Roberta recalls today. Like many New Yorkers, she had taken her Judaism for granted, breathing it in with the air of the Boro Park neighborhood where she taught. But life in suburban Dallas made her acutely aware of their religious identity and brought her to the realization that she had to become active in her synagogue. The committee members were not only welcoming, they gave ­Roberta more and more responsibility, which ultimately included joint chairmanship (with the late Mark Siegel’s wife, Nancy) and representing adult education on Beth Torah’s board of directors. And her synagogue involvements expanded to include working with its Social Action program in efforts benefiting an array of agencies, from Jewish Family Service to East Plano’s City House for at-risk teens. But education never lagged behind. Roberta has continued to further her own Jewish studies in the Melton Program offered at the Aaron Family Jewish Community Center; she has served on the Melton board, and on those of both BBYO and North Texas Hillel. Through it all, Roberta works with her husband in his risk management firm, RWL Group. And she is mom to firstborn Adam, now 37, a criminal defense attorney; in the middle is insurance man Brett, father of their granddaughter; and their youngest, Shane, currently a student. The Jewish Studies Initiative of North Texas broadens the horizon of interreligious dialogue with its new series called Faiths in Conversation. Rabbi Hanan Schlesinger, the executive director of JSI, has long been involved in dialogue with Christians and Muslims. This new series is intended to take interfaith dialogue to a whole new level of seriousness and depth. The first installment in the series will take place at 7 p.m., Thursday, Feb. 7, at the Northway Christian Church, 7202 W. Northwest Hwy., Dallas. The session will be devoted to the possible tension between divine authority and personal conscience, and will grapple with the question: As a submissive servant of God, should the religious person ever think or act according to his own moral understanding? Jewish, Christian and Islamic perspectives will be shared, respectively, by Rabbi Schlesinger; the Rev. Dr. Douglas Skinner, senior minister of the Northway Christian Church; and Ustadh Nouman Ali Khan, founder and CEO of the Bayyinah Institute. The second event in the Faiths in Conversation series will take place at 7 p.m., Wednesday, April 10. The topic will be “How I Pray — As a Jew, Christian, or Muslim.” The venue is to be announced. For more information please contact Rabbi Schlesinger at ravhanan@sbcglobal.net. Incidentally, Rabbi Schlesinger will serve on an interfaith panel at 7 p.m. Feb. 6, as part of the Southern Methodist University’s Association of Student Counselors at Perkins School of Theology, Prothro Hall, Room 106, 5901 Bishop Blvd. The discussion is titled “Service as a Universal Prescription for Well-Being” and will explore how service has been beneficial to communities across cultural and religious traditions over the centuries, linking up to the current researched benefits of being of service as a therapeutic model. The idea of service in the mental health profession began with the works of the 19th-century psychiatrist Alfred Adler, whose idea of treating the individual within one’s social construct was paramount in healing, forming the scientific foundation for the benefits of service to mental health. Among the hottest topics right now is immigration reform. At 7 p.m., Thursday, Feb. 7, at the Aaron Family JCC, Richard Foltin, AJC director of legislative affairs, and Mark Hetfield, executive director of HIAS (Hebrew Immigrant Aid Society) will discuss this issue and other legislative agenda items. The event is free and open to the public. For more details contact ­dallas@ajc.org or 972-387-2943. • Sixth-grader Bear Steinberg, son of Laurie and Marc Steinberg of Dallas. Bear won the McCulloch Intermediate School Geography Bee. • Leigh Kellner, daughter of Marci and Mark Kellner of Dallas, earned a Bachelor of Science in advertising at UT Austin in December. Leigh graduated from J.J. Pearce High School in 2009. • Eliana Gershon, daughter of Raquel and Rabbi William Gershon of Dallas. Eliana was awarded the 2013 North Campus MLK spirit award at the University of Michigan. This award recognizes students whose leadership and service exemplifies the spirit of Dr. Martin Luther King Jr. The award was presented on Jan. 21 at a banquet in the Gerald R. Ford presidential library. Usually I let that bruising, tear-infused memory enter my consciousness for just a moment before fading away for another year. But this year, it resonates with me in a newer context. I have a couple of concerns after finishing her book. First, that any non-Jewish readers without other knowledge of our very diverse people may think all Jews are like those Feldman knows so well and describes so pejoratively. Second, that the “liberated” Feldman may find in herself an ongoing war between her own two worlds: the repressive one she has left and the wide-open one in which she has chosen to live. Satmar devotion is practiced in hopes of bringing closer the Messiah’s coming through absolute acceptance of God’s word and will. The men study the first, interpreting it strictly, then imposing their interpretations upon their wives and their children, as well as themselves. As for the second, it covers everything that happens — even disasters like the Holocaust are “God’s will,” brought about as punishment for Jews’ non-compliant behavior. Feldman’s revolt emerges early from a childhood that repressed her desires to learn about any bigger world. She broke some rules, like secretly reading secular books — mostly American girlhood classics such as “Little Women” — then suffering doubly, from guilt at her own disobedience more than raw fear of being caught. She chafed, physically and emotionally, under the heavy burden of the restrictive “modest” clothing she and all her contemporaries had to wear. Of course, this was not to be. Eli was not the sweet, understanding partner she had hoped for. Eventually she gave birth to a son — sparing the reader none of her difficulties along the way. Eventually, also, she broke with her past, starting with clandestine enrollment in an adult education program where her way with words and her unusually compelling story were recognized and first put together into what became this book. I wish her luck. And I hope her second memoir, which she’s working on now, will assure me that she’s indeed smart enough to build the fulfilling life she always dreamed of. I love hearing about folks’ spontaneous efforts toward tikkun olam. Read on to learn about a nifty project spearheaded by Brentfield sixth grader Sydney Bennett. 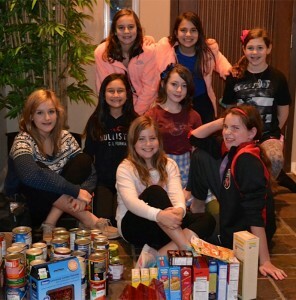 The girls spent close to two hours knocking on doors to collect donations for Operation Kindness, Goodwill, North Texas Food Bank and the National Multiple Sclerosis Society. In that short time, they collected 60 items for Goodwill, 150 canned food items, and $185 for MS and 10 items for Operation Kindness. Sydney is the daughter of Leigh and Scott Bennett. Yasher koach! Akiba Academy will welcome New York Times bestselling author, educator and family counselor Michael Gurian to the school at 7:30 p.m., Wednesday, Jan. 30 as part of its Pollman Lecture Series. The talk is free and open to the community. A prolific author of 25 books, Gurian’s research has demonstrated how the distinction in hard-wiring and socialized gender differences affects how boys and girls learn. Gurian presents a new way to educate children based on brain science, neurological development, and chemical and hormonal disparities. His innovations have been applied in classrooms throughout the country and proven successful, with dramatic improvements in test scores. In his best-selling classic “Boys and Girls Learn Differently,” he explained the origin and nature of gender differences in the classroom. His important book explored the behavior teachers observed and the challenges they faced with both boys and girls in their classrooms. Yavneh Academy will host its annual Maddie’s Mitzvah blood drive from 9 a.m. to 3 p.m., Friday, Jan. 25 in the school’s Pollman Hall (12324 Merit Dr., Dallas). First dedicated seven years ago for Maddie White, the granddaughter of Bill Burns, long the school’s printer and supporter of its programs and events, Yavneh is glad to report that Maddie who at one time required many surgeries and the transfusion of hundreds of pints of plasma, whole blood and platelets, is a thriving seventh grader and is doing well. This year, Yavneh has added a bone marrow registration drive, in partnership with Delete Blood Cancer (www.deletebloodcancer.org) to its Maddie’s Mitzvah, in the merit of good health toward community member Zach Guillot. Walk-in donors are welcome or contact Deb Silverthorn at 972-839-6916 or info@yavnehdallas.org to request an appointment. Lauren Stock will speak to Yavneh’s students Friday morning about her High School Heroes program, promoting bone marrow registration for students when they turn 18. The application process for the Klein Summer Internship Program is underway at JFS. High school sophomores or juniors who turn 16 by Sept. 1, 2013, are eligible to apply. This six-week internship program gives students the opportunity to work with non-profit agencies in the DFW area, matching each student’s individual interests and skills with the needs of the participating agencies. There are approximately 25 internships available this year. Students are considered for internships without regard to religion, race or ethnicity. Applications are due by 5 p.m. on Monday, Feb. 11. Submit online or by email to Beri Schwitzer at bschwitzer@jfsdallas.org. For more information or an application, visit http://www.jfsdallas.org/rabbi-gerald-j-klein-summer-internship-program. • Austin College senior Ariel Marder was named by the Jewish Sports Review as a First Team All-American in women’s soccer, Marder, a midfielder from Plano, is one of just 11 players to be named to the First Team, which consists of players from the NCAA Division II, NCAA Division III, and NAIA levels. Marder, who was an All-Southern Collegiate Athletic Conference selection this season, scored two goals, including one game winner, and was among the conference leaders with eight assists. She also led the ‘Roos with 12 total points for the year. Austin College athletic teams participate as a member of the NCAA Division III and the Southern Collegiate Athletic Conference. Ariel is the daughter of Beth and Charlie Marder. • Alan Rosenthal, 18, a St. Marks’ senior has been named to the Maccabi USA Cycling team and will travel to Israel for the 19th annual games in July. You may remember Alan from a Good Sports profile in the TJP in September 2011. He is fairly new to biking; he picked up the sport during his freshman year. The cycling season has started and Alan has been training hard for the past few weeks. His first races of the high shhool season will be Feb. 9 and 10 at the Cedar Hill Race Festival, which is a pre-season event. After that, he will compete in statewide races. 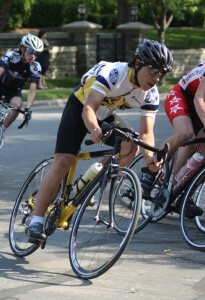 The last race he competed in was the Junior 4/5 McInnish Park Crit in December where he placed 1st. A “crit” or criterium is a short, fast bike race usually less than five kilometers. Often held on closed-off city streets, it requires a great deal of technical skill due to the tight corners and close competition. Like all Maccabi USA athletes Alan will be required to raise $5,000 for his trip. To help support Alan’s Macabbi USA efforts visit his fundraising page at tinyurl.com/arhmauv. Alan is the son of Ana and Leon Rosenthal of Dallas. • Ben Schachter, son of Amy and Steve Schachter won the Levine Academy Middle School Geography Bee sponsored by National Geographic. Ben is now eligible to take a written test to qualify for the regional competition. • Amanda Steinborn, daughter Vivian and David Steinborn of Dallas has been accepted into the American Hebrew Academy Honor Society. Amanda is an eighth grader at Akiba Academy. The Academy, America’s premier Jewish pluralistic college-prep boarding school, recently extended invitations to 50 students worldwide for admittance into its exclusive organization. Now in its fourth year, the American Hebrew Academy Honor Society is an international honor society that acknowledges exceptional 8th and 9th grade students, like Amanda, who have demonstrated excellence in academics, athletics, the arts, leadership and service to their communities. • Dalit Agronin, daughter Carol and David Agronin of Dallas earned Dean’s lists honors for the Fall 2012 semester of Muhlenberg College in Allentown, Pa. Students must earn a minimum of a 3.5 grade point average (4.0 scale) to attain Dean’s List status. A member of the class of 2016, Dalit is a graduate of Yavneh Academy. Keep the news coming! We love to hear from our readers. Send your news to me at sharonw@texasjewishpost.com or by snail mail to me at 7920 Belt Line Road, Ste. 680, Dallas, TX 75254. Tu B’Shevat may not have the splash of last month’s Chanukah or the rowdiness of next month’s Purim, but according to area Jewish leaders, Tu B’Shevat, with its emphasis on trees and the environment, is an important date on the Hebrew calendar. This year, Tu B’Shevat — literally the 15th day of the month of Shevat on the Hebrew calendar — takes place from sundown Friday, Jan. 25 to sundown Saturday, Jan. 26. During that period, organizations throughout the Dallas-Fort Worth area will focus on everything from the meaning of trees to Judaism, to the relationship between Jews and the planet. At Congregation Ahavath Sholom in Fort Worth, children attending the religious school will plant in Gan Ahavath Sholom — its new community garden — and will also take part in a Tu B’Shevat seder. Meanwhile, in Dallas, Congregation Shearith Israel will have a full-fledged seder, complete with four cups of wine, tasting of fruits, singing, dancing and a dairy dinner. Congregation Anshai Torah in Plano also is having a seder for adults and kids, with foods native to Israel, such as figs, olives and carobs. Congregation Beth Torah in Richardson will have a congregational Tu B’Shevat Shabbat dinner. “We try to get both the children an adults attuned to Tu B’Shevat and environmental concerns,” said Bob Westle, Anshai Torah’s education director. 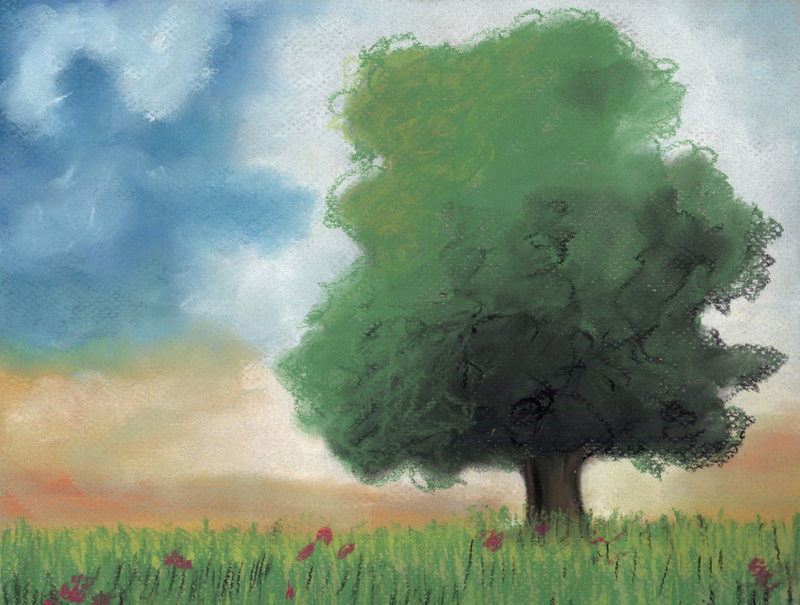 In addition to trees, Tu B’Shevat focuses on the environment and environmentalism. But environmentalism and ecology take on different forms in the secular world — some folks are content to stick soda bottles in a recycling bin and call that “environmentalism,” while others refuse to use plastic bags at the grocery store and build a compost heap in their backyards. Given the different definitions of “environmentalism,” it’s probably little wonder that Tu B’Shevat observations and celebrations can differ greatly. Even the origins of the specific holiday differ. CSI Associate Rabbi David Singer explained that the sages don’t refer to Tu B’Shevat specifically, but to a tree’s “new year” throughout the Mishnah. The sages explained that understanding a tree’s age was hugely important, as it determined whether its fruit would be eaten or offered to the Temple. “During the first three years of a tree’s life, it’s not ours, but God’s,” Singer commented. Rabbi Benjamin Sternman of Adat Chaverim in Plano also said Tu B’Shevat’s origins were born from tithes during the days of the Temple. Once the Temple was destroyed and the Diaspora was in full swing, many things changed; one of which was the meaning and observation of Tu B’Shevat. Some Reform congregations encourage religious school students to plant parsley at this time of year, Sternman added. 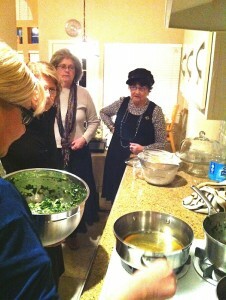 By Pesach, the vegetable will have sprouted and be ready for harvest, to be used at the Passover seder. Yet the Tu B’Shevat seders throughout the area encompass more of the mystical side of the holiday, in addition to its practical viewpoint. Rabbi Nasanya Zakon, director of DATA of Plano, noted that Tu B’Shevat seders are filled with blessings over unusual fruits and nuts. Singer agreed, pointing out that the Tu B’Shevat observance, no matter which form it takes, provides a priceless opportunity to reflect on the beauty of creation, and to ensure that beauty is cared for. In addition to the “attitude of gratitude” focus, the holiday offers a good time to reconnect with, and protect, the Earth, something that’s mentioned over and over throughout the Bible. Tu B’Shevat offers interesting symbolism, especially if examined through Kabbalistic eyes, Zakon said. The holiday takes place during a time of year in which sap begins flowing in trees. The mystics explain Tu B’Shevat as a holiday that sets the stage for growth – both human and plants – because it’s a holiday that launches internal growth. Singer believes that, however it’s celebrated, Tu B’Shevat is nature’s wake-up call to Jews. “Much like the shofar blast during the High Holy Days is a wake-up call to our souls to help perfect our beings, Tu B’Shevat is the wake-up call for us in regards to nature, reminding us that we have an opportunity and obligation to protect the planet,” he said. This is the time of year when the weather is weird — one day it’s in the upper 60s and we fling the windows open; the next day a blue norther comes through, forcing us to slam the windows shut and turn on the furnace. It’s also the time of year to expand our minds a little. Many organizations have Shabbatons and “scholar in residence” programs, all of which are geared to connect us further to Judaism. In previous columns, I’ve written about the Kornbleet Memorial Scholar-in-Residence program, which takes place at Congregation Ahavath Sholom (4050 S. Hulen in Fort Worth) beginning at 7:30 p.m. Thursday, Feb. 7. Raphael Danziger with American Israel Public Affairs Committee and editor of the Near East Report is the guest speaker. A couple of days before the Kornbleet event, on Tuesday, Feb. 5, CAS launches another series, this one titled “Jews in America.” The first of the five-part lecture series begins at 7 p.m. and will run Tuesdays through March 5. During these presentations, Jane Guzman Pawgan will take participants through the history of Jews in America, from colonial times to 1948. Those of you who know the presenter know that she brings all kinds of experience to her presenter’s role — she’s a doctor of philosophy, is well educated in American history and political science and is part of the adjunct faculty at schools such as Texas Woman’s University, Richland College and Tarrant County Junior College, among others. She also lectures at the Aaron Family Jewish Community Center in Dallas and at SMU. I could go on, but you get the point — she knows her stuff. Even better is that this series is free and open to the public, as is the Kornbleet program. … is Congregation Beth Israel’s “Good Food, Good Learning, Good Community” series, featuring guest speakers, dinner and the evening service. Dinner begins at 6 p.m., the service launches at 7 p.m. and the speaker comes on board at 7:30 p.m. Coming up are Kol Ami’s Rabbi Geoff Dennis (Wednesday, Feb. 6) and Ron Bernstein, Jewish National Fund Israel Emissary for the Southwest (Wednesday, March 6). All take place at CBI, 6100 Pleasant Road in Colleyville, and are supported by the Jewish Federation of Fort Worth and Tarrant County. To RSVP, email administration@congregationbethisrael.org. This time of year is also a good one for some movie-watching. Specifically, movie-watching at Beth-El Congregation’s film festival. Films still to be offered are “Bride Flight” (Saturday, Feb. 16) and “My First Wedding” (Saturday, March 23). The films will be shown at the synagogue, 4900 Briarhaven in Fort Worth. They’re free to the public, but an RSVP is suggested. Either call Beth-El at 817-332-7141 or email bethelofc@bethelfw.org for more information. Women of Reform Judaism are gearing up to host its annual donor brunch — the organization’s main fund-raiser — which takes place from 9:30 a.m. to noon on Sunday, Feb. 3 at Beth-El Congregation, 4900 Briarhaven in Fort Worth. This year’s theme is “Fifty Shades of Red,” and, appropriately enough, will feature Israeli wines. Robert Chicotsky of Chicotsky’s Liquor Store will offer his take on the wines, and provide a mini-wine tasting with some good advice about wine-meal pairings. Feastivities is providing the brunch, a silent auction will take place — and RSVPs are still being accepted (through Jan. 25). Interested? Log onto www.bethelfw.org for more information. Funds benefit Beth-El’s religious school and scholarships to Greene Family Camp, among other worthy charities. And the CAS Ladies Auxiliary needs volunteers to help make hamantaschen between 9 a.m. and 2 p.m. Feb. 3 and 10 in the synagogue’s kitchen — the address is 4050 S. Hulen in Fort Worth. All the ingredients will be provided; what’s needed are helping hands. Those interested in helping out can call 817-731-4721. The hamantaschen, incidentally, will be for sale (flavors include apricot, prune, poppy seed and raspberry) at a cost of $12 per baker’s dozen. Advance orders are welcome; call the number above for more info. It’s not too late to send “holiday vacation” information to be published in Around the Town. Did you go somewhere fun? Did family come town? Did you celebrate with friends? Let us know! Send your info to me at awsorter@yahoo.com.